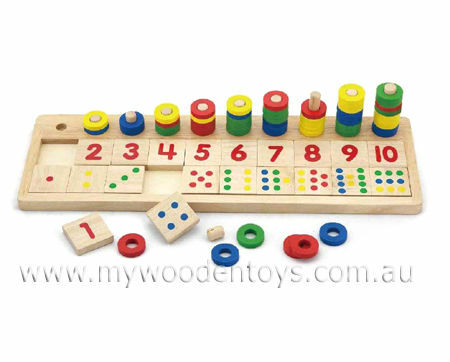 Wooden Count & Match Numbers is a well made educational toy to help teach numeracy skills. This maths aid gives a very clear visual representation to help your little one grasp mathematical concepts. Dots, numbers and stacking rings provide different ways to understand those tricky sums. A very useful toy which will have your child adding, subtracting and dividing in no time. Size: 41 x 13 x 75 cm. Material: Rubber Wood, Child-safe paints. We like this because:"well made many different ways to learn."